Since the last update, there have been polls in Michigan and Wisconsin. 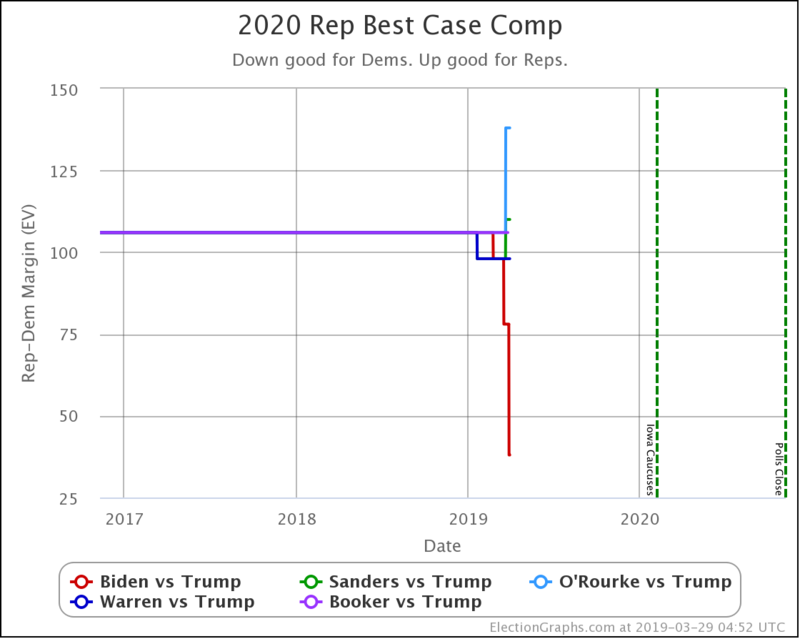 The only category changes that resulted were in the Biden vs. Trump matchup. Wisconsin moved from Weak Biden to Strong Biden. 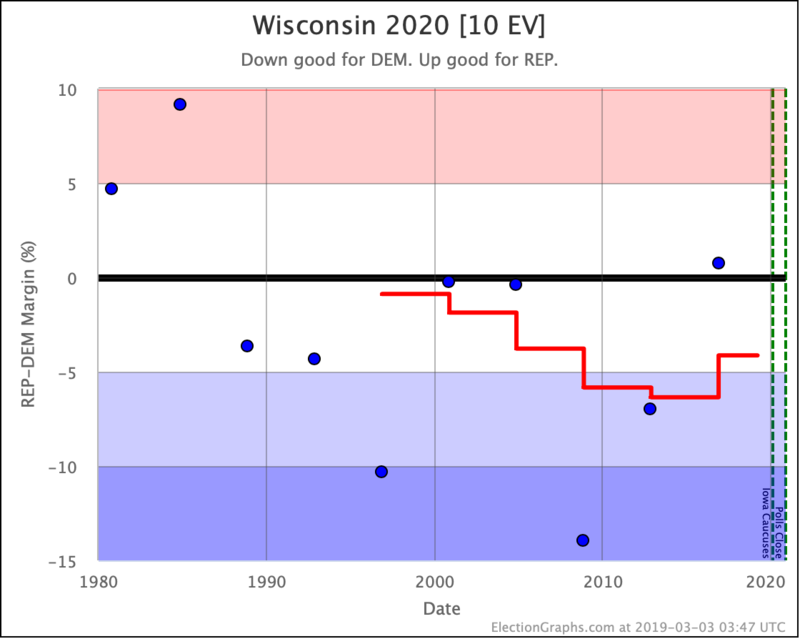 Only the second of these changes the Election Graphs "expected range," lowering Trump's "Best Case" from a 98 electoral vote win to a 78 electoral vote win by taking Wisconsin out of the list of swing states. 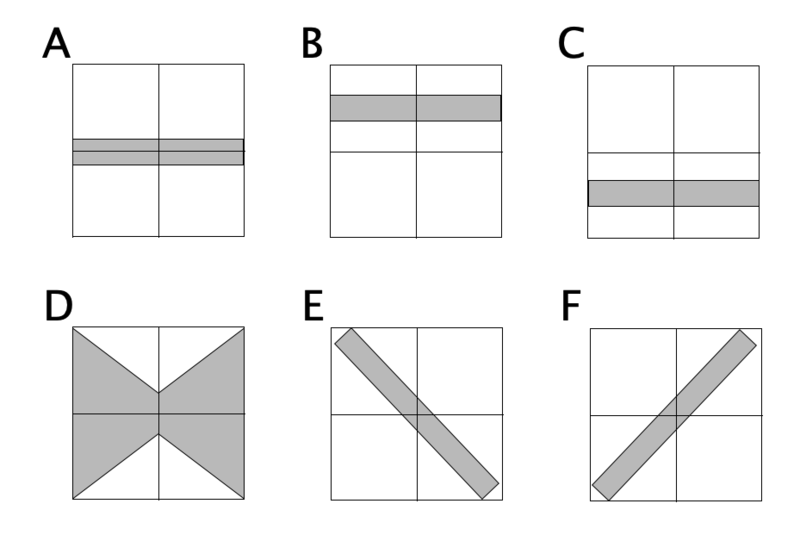 That dip in the upper right of the "envelope" represents this change. 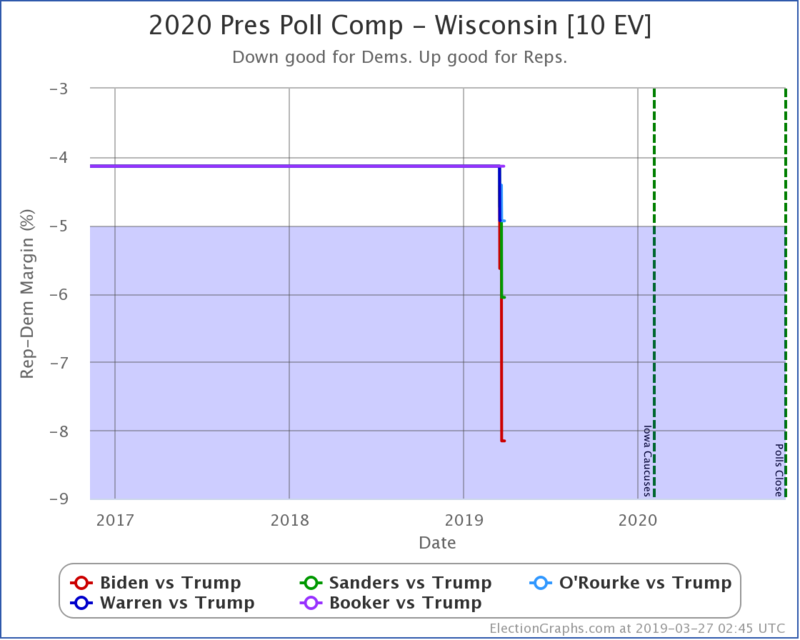 Now, keep in mind that this is the result of the very first Biden vs. Trump poll in Wisconsin. 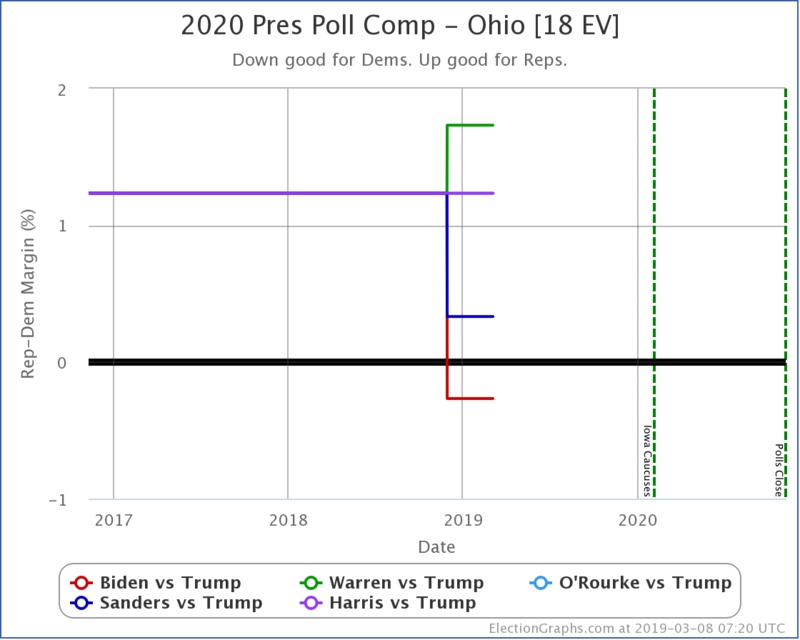 It showed Biden leading Trump by 8.6% in a two-way race, and leading by 6.8% if you include Schultz as a third party candidate. Since the 2000 election result, where the Democrat won by 0.2% was getting knocked off the average, this represents an improvement. 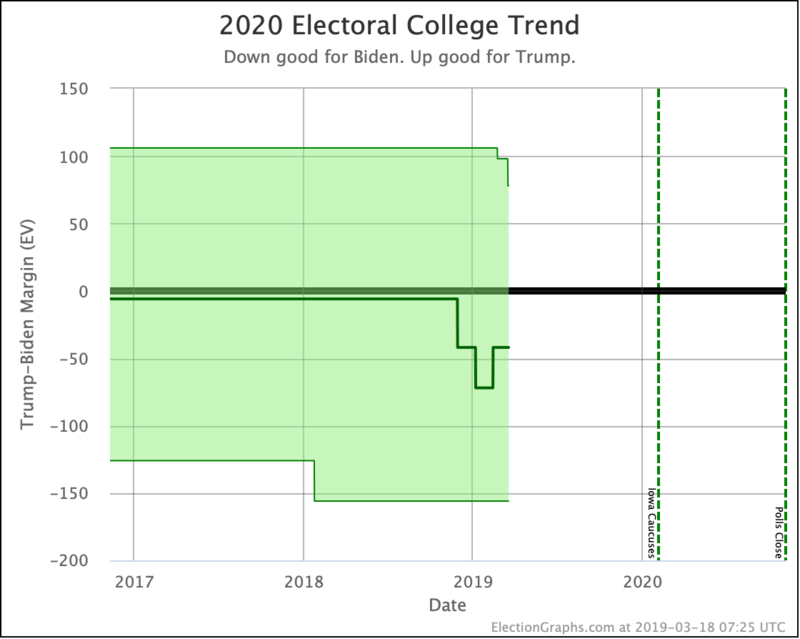 The average goes from a Democratic lead of 4.1% based on the last five presidential elections, to a 5.6% Biden lead based on the previous four presidential elections, plus this first poll. But this is still only one poll. 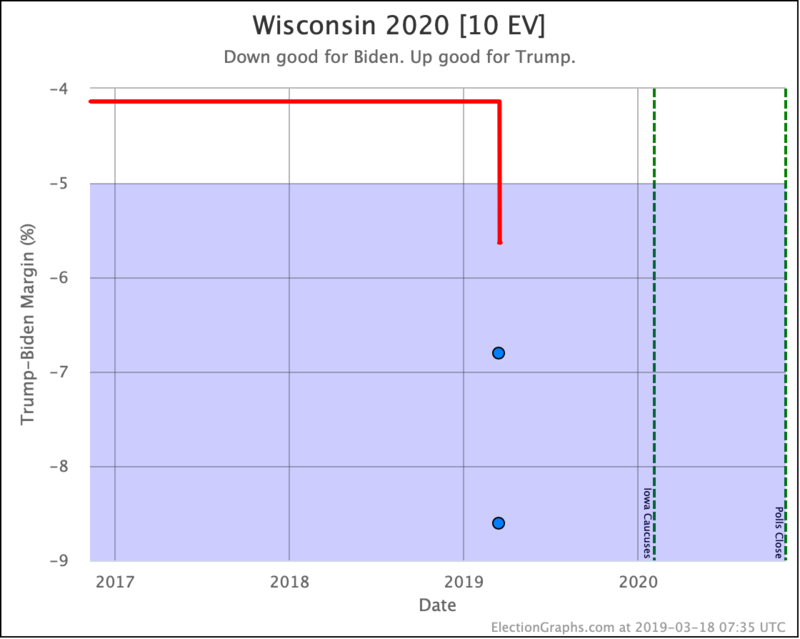 And of course people will point out that the final Election Graphs average in Wisconsin in 2016 was Clinton up by 7.1%, and Trump still won by 0.8%. 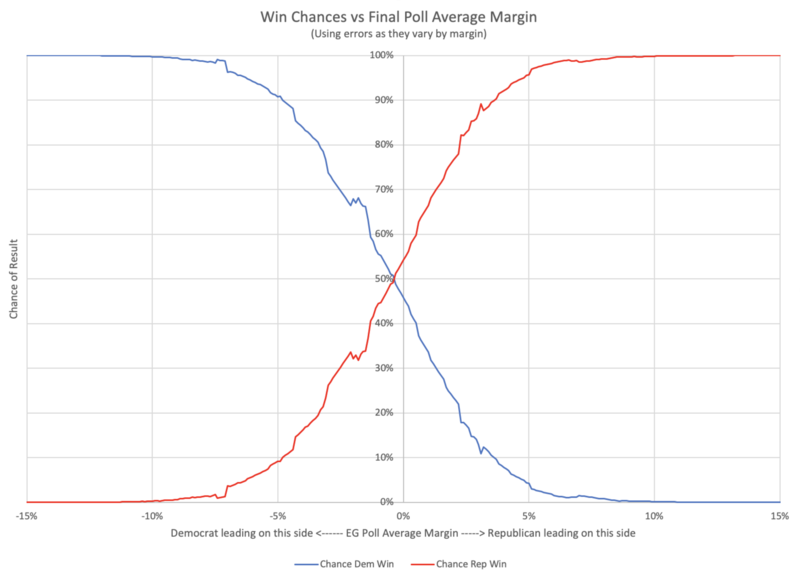 So yes, polls can be wrong. But that was one of only a very few. 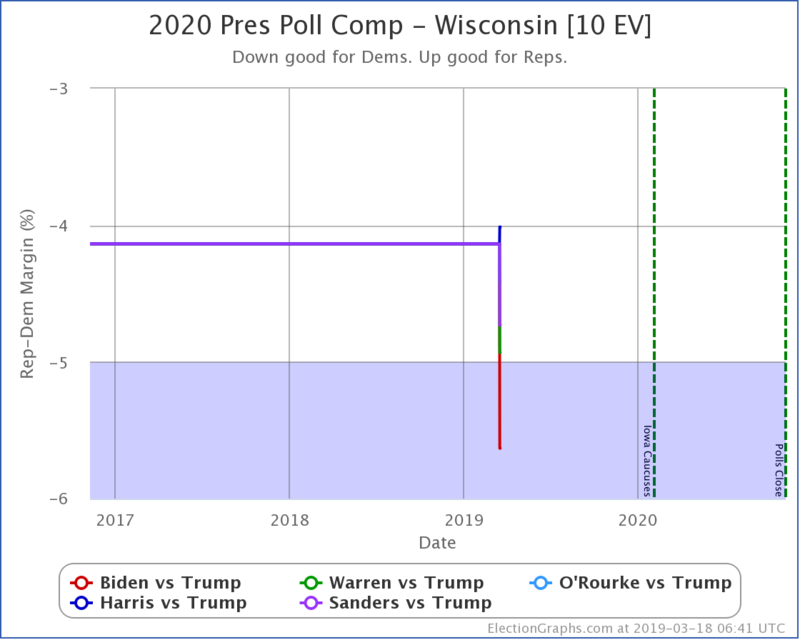 For now though, with this minimal data, Biden is looking very good in Wisconsin. 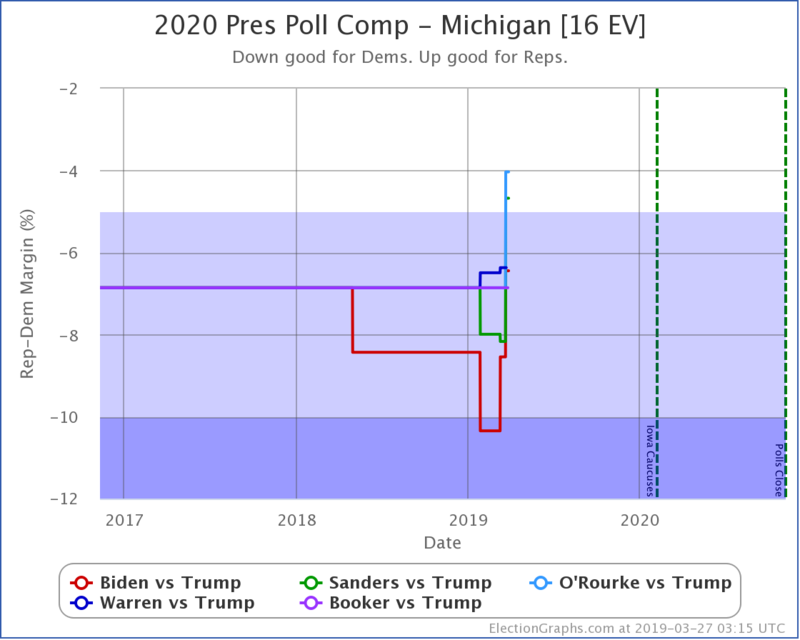 And just checking the comparisons with how other candidates are doing against Trump, Biden is still doing better than the other four "best polled" Democrats in both Michigan and Wisconsin. 596.6 days until polls start to close. Stay tuned. 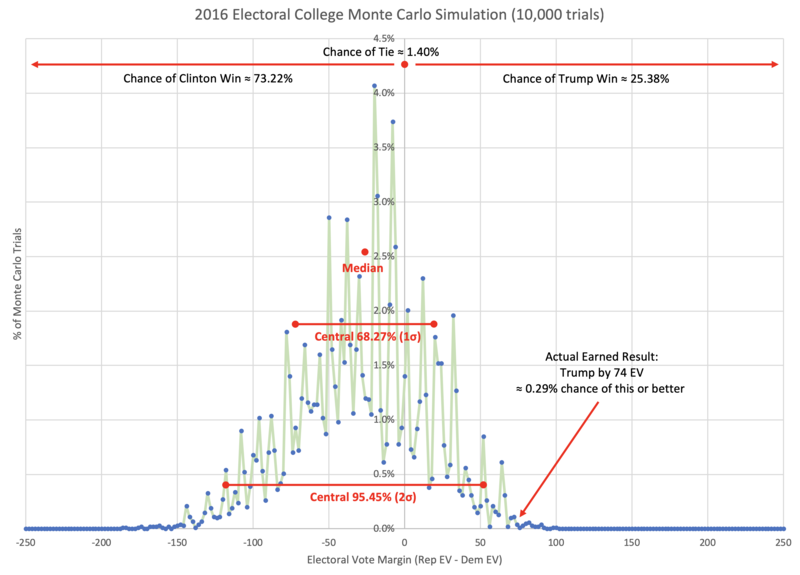 This post is an update based on the data on the Election Graphs Electoral College 2020 page. 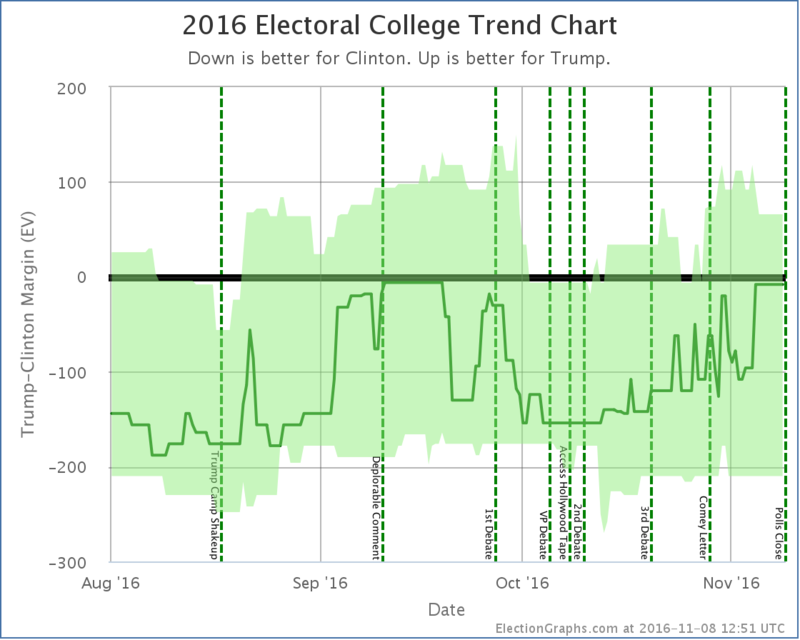 Election Graphs tracks a poll-based estimate of the Electoral College. The charts, graphs, and maps in the post above are all as of the time of this post. Click through on any image to go to a page with the current interactive versions of that chart, along with additional details. 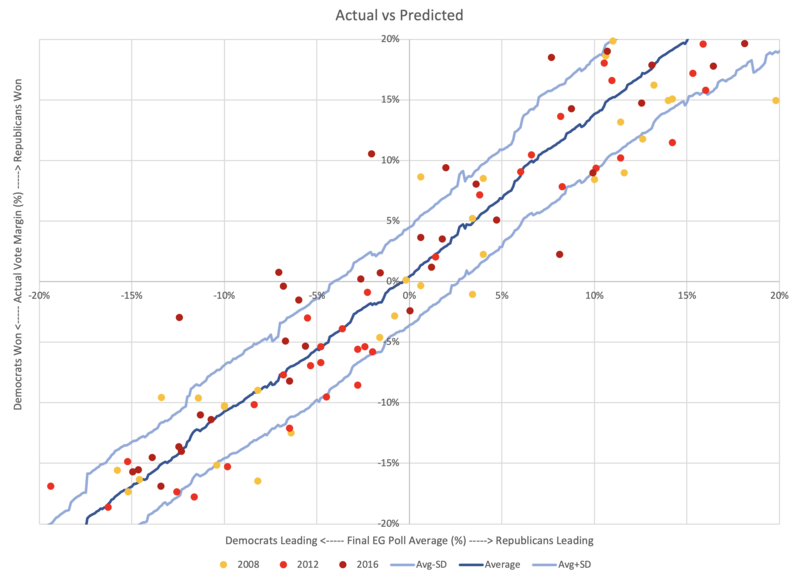 Follow @ElectionGraphs on Twitter or Election Graphs on Facebook to see announcements of updates. For those interested in individual poll updates, follow @ElecCollPolls on Twitter for all the polls as I add them. If you find the information in these posts informative or useful, please consider visiting the donation page. A few days ago I looked at where all the states ended up if you just look at the average results of the last few elections. No 2020 specific data. 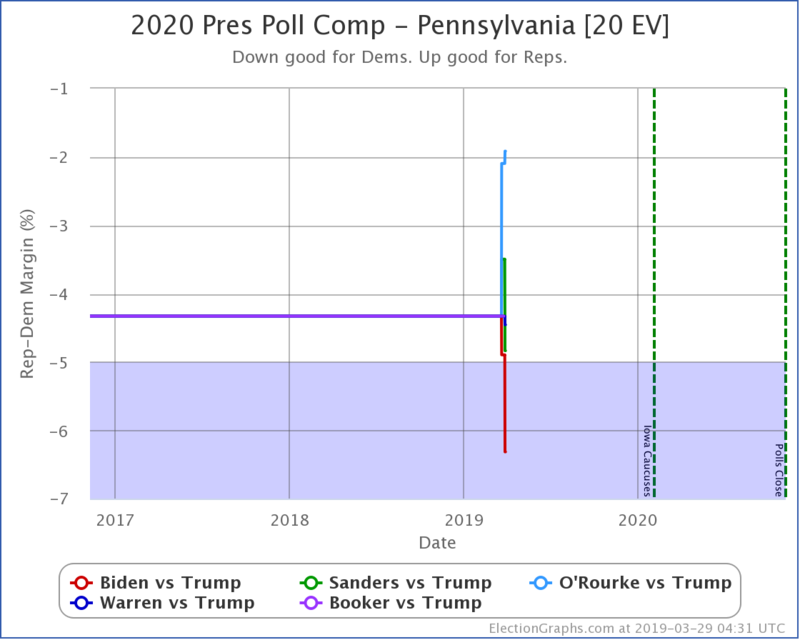 But there have already been state level 2020 polls. Sixteen by my count. They are now all included on Election Graphs. When I do updates here, unless there is a strong reason to do otherwise, I'm going to only discuss the five "best polled" candidate pairs. At the moment, the only Republican polled so far has been Trump. (Sorry Weld fans.) 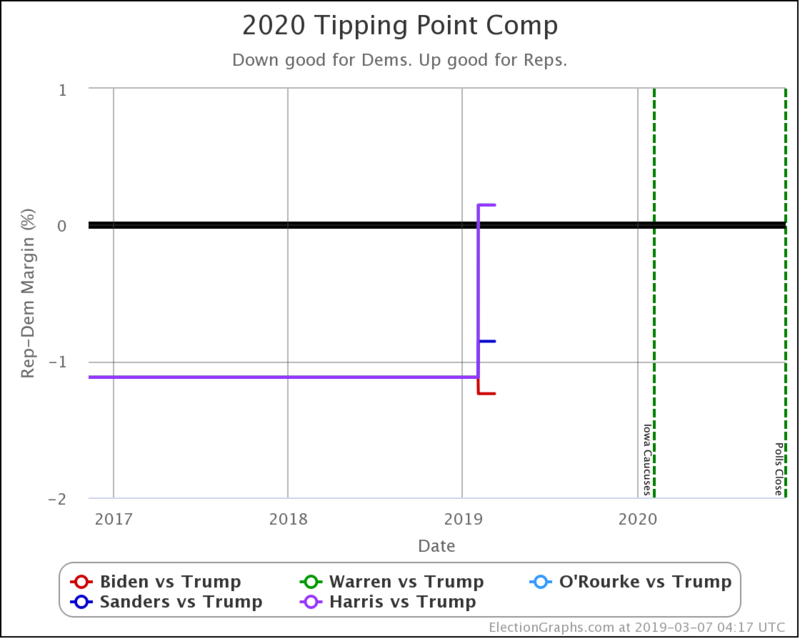 The five best polled Democrats against him right now are Biden, Warren, O'Rourke, Sanders, and Harris… in that order. So with that out of the way, let's start looking at some graphs! 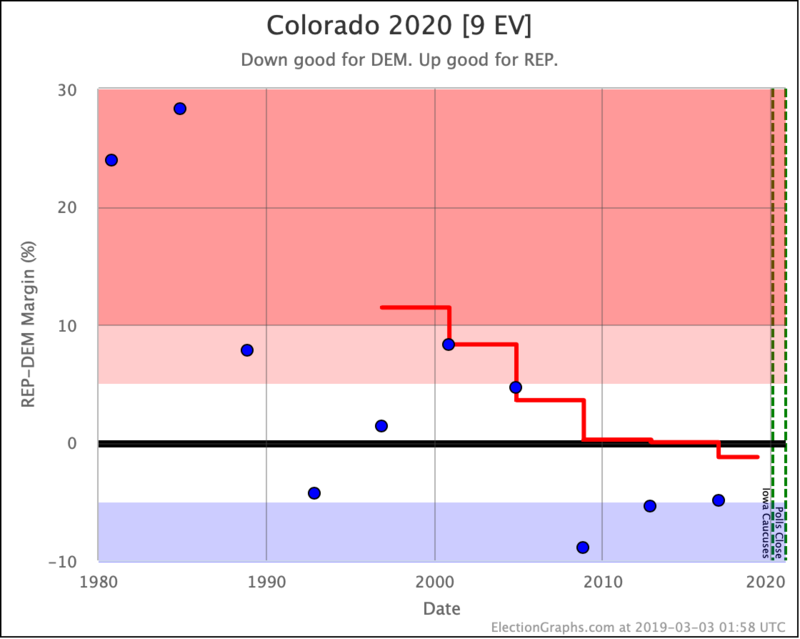 The chart above shows the "expected" electoral college result for each of these five candidate pairs, assuming each candidate wins all the states they lead in the Election Graphs five poll averages. This average still includes previous election results since there are no states where there are actually five polls yet. So what do we see? 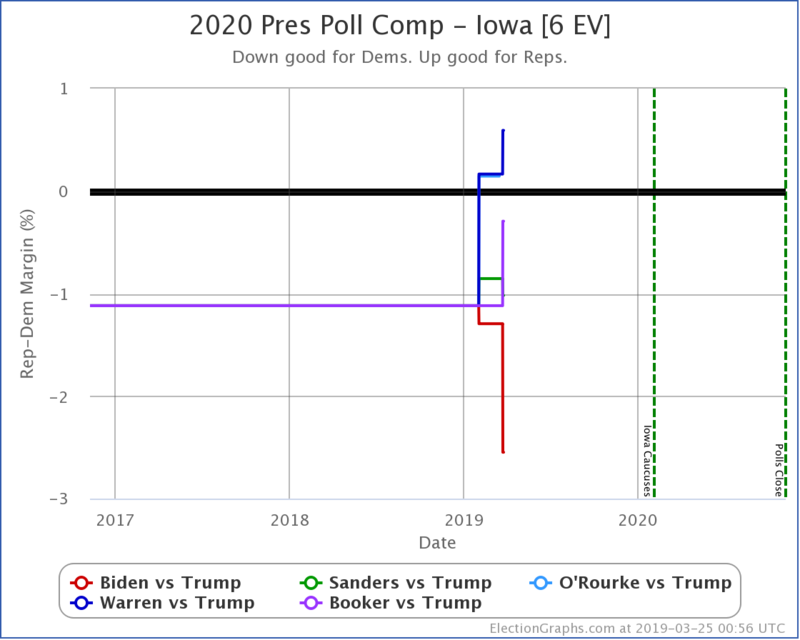 From the very limited polling we have so far, we see Biden doing noticeably better than any of the other four Democrats when pitted against Trump. In the electoral college, Biden leads Trump by a 42 electoral vote margin. Sanders leads Trump by 6 electoral votes. And then Warren, O'Rourke, and Harris all lose to Trump by 6 electoral votes. 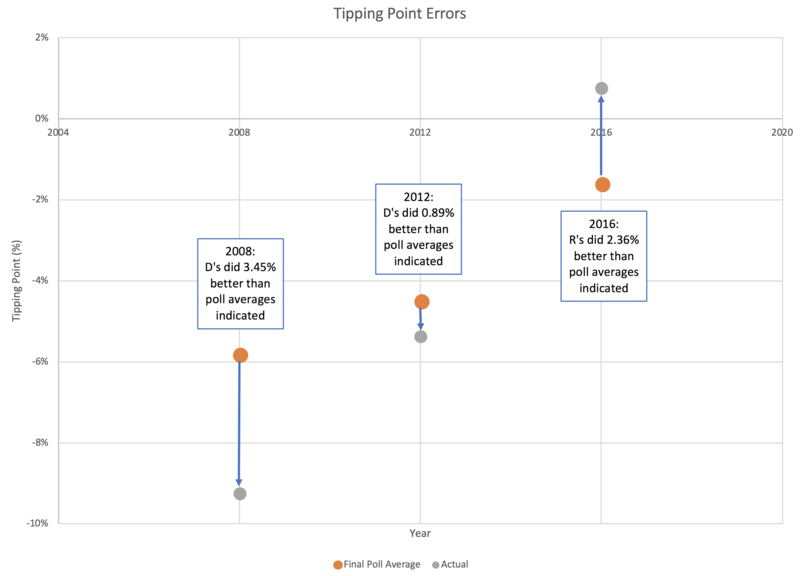 The "tipping point" is perhaps a better way to look at things. 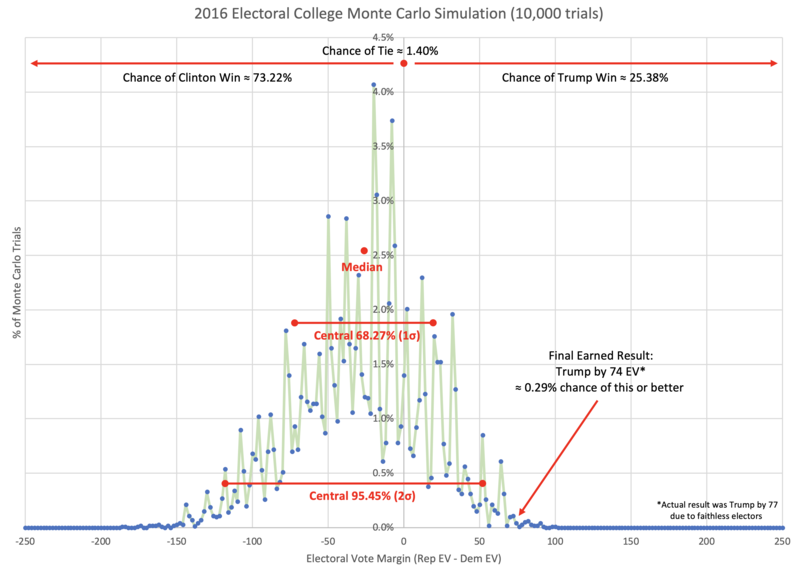 It is similar to looking at a popular vote margin, but adjusted for the structure of the electoral college. 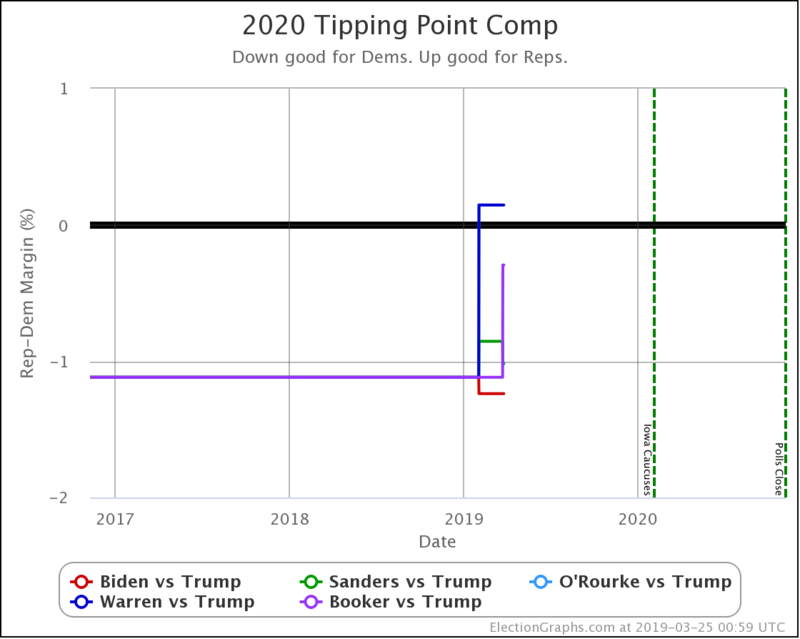 Here Biden has a 1.2% tipping point margin over Trump and Sanders has a 0.9% tipping point margin over Trump, but Warren, O'Rourke, and Harris all trail Trump by an 0.1% margin. Frankly, ALL of these results, for all five possible opponents to Trump, are firmly within the "too close to call" zone. Even if it was the day before the election, not 607 days before the election. With this much time left, and with the extremely limited polling so far, any patterns we see may easily disappear as new polls come in. It might even be safe to say they will probably disappear. It is still very very early. Having said that, the Biden advantage is even more striking as you start looking state by state. The following charts show how the polling average in each state has moved as the polls so far have come in. 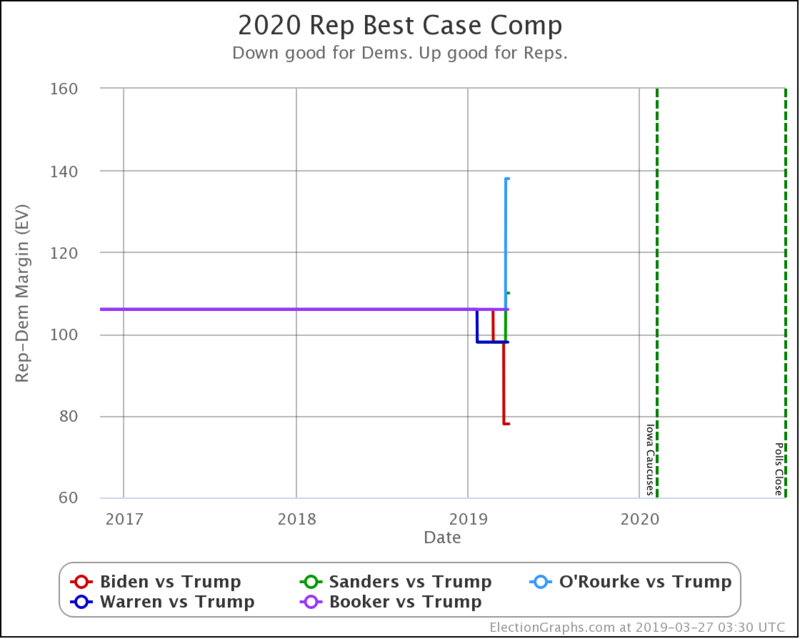 Note: Keep in mind these are all measuring how each of the Democrats would fare against Trump in the general election, NOT how they might fare against each other in the primaries. Watch the red line. 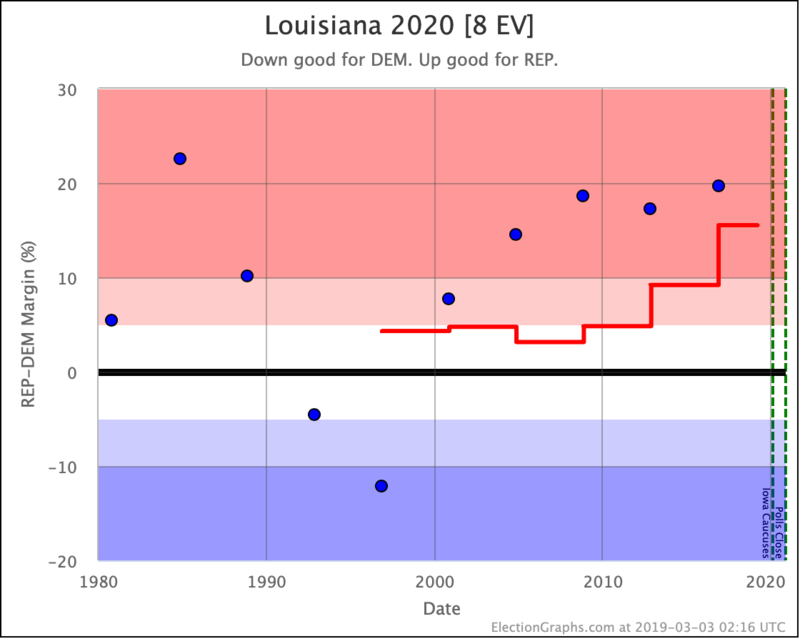 The red line is Biden. 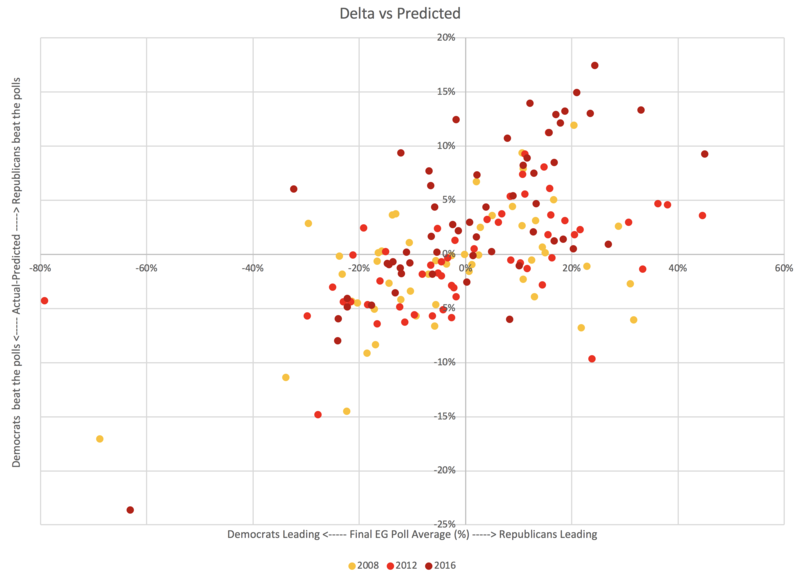 Down is better for Democrats. 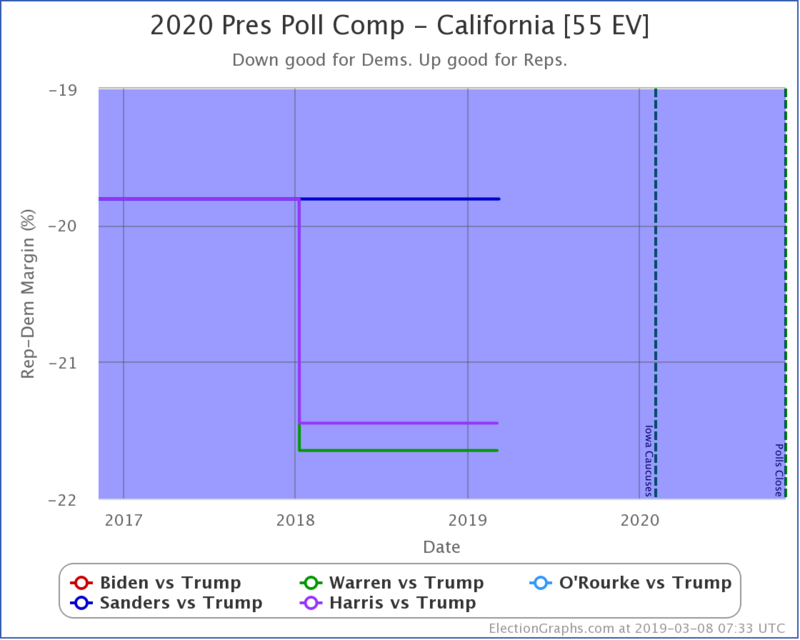 OK, in California Biden hasn't broken out. He hasn't actually been polled in California yet. So his average is just the average of the last five presidential elections. 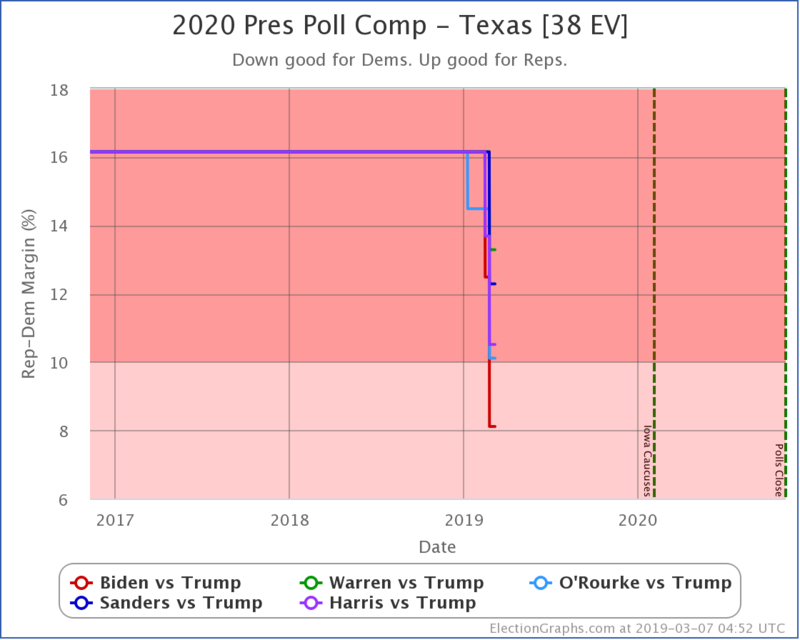 Biden doing better than the other four Democrats in Texas. 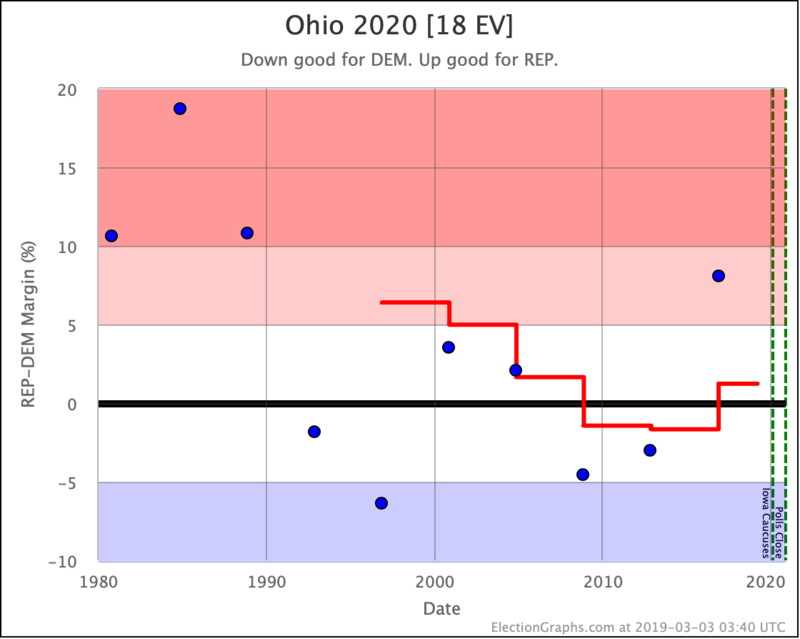 Biden doing better than the other four Democrats in Ohio. 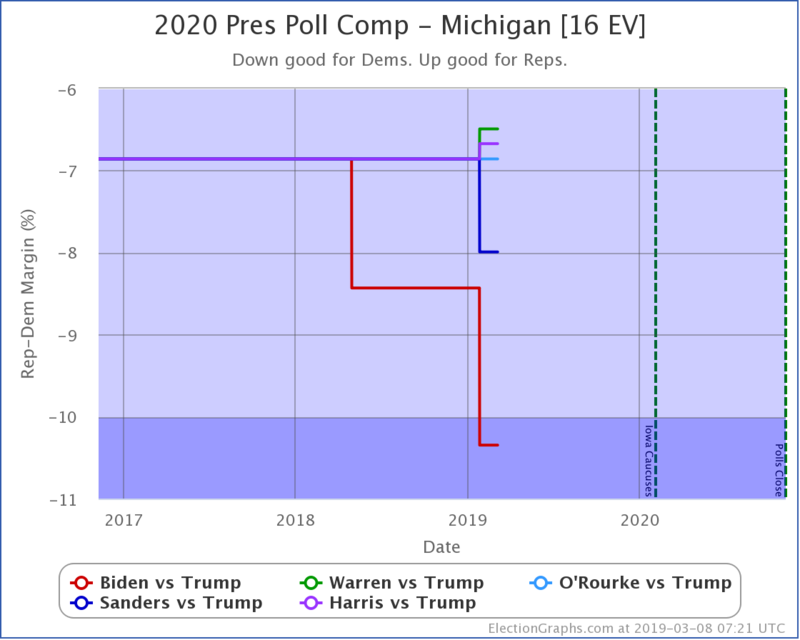 Biden doing better than the other four Democrats in Michigan. 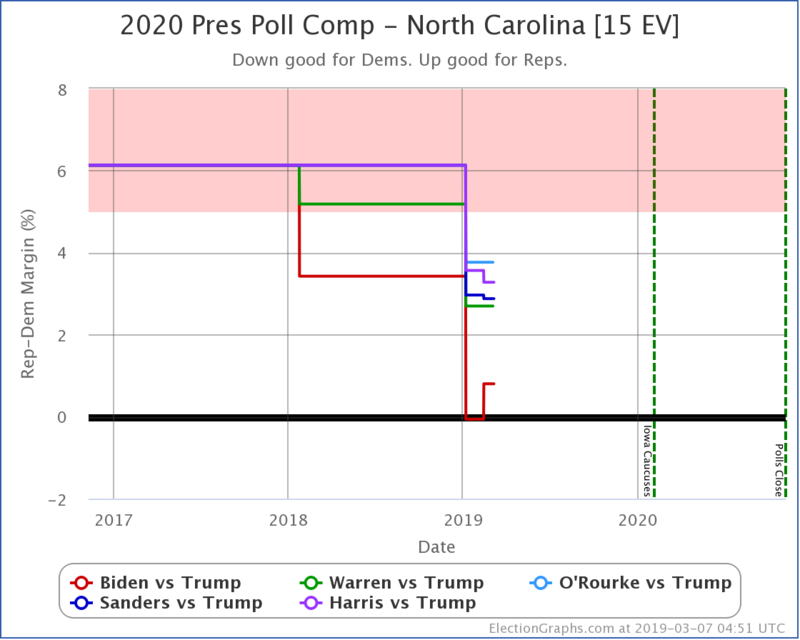 Biden doing better than the other four Democrats in North Carolina. 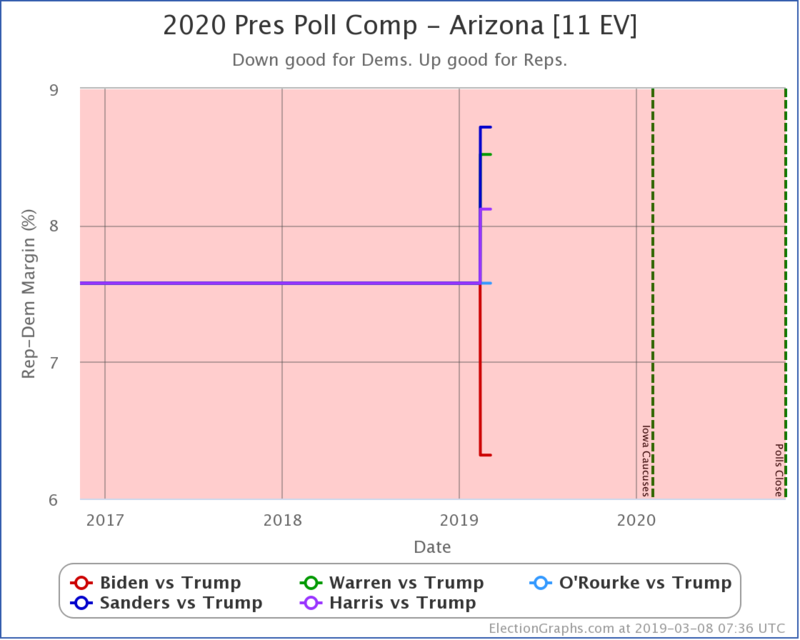 Biden doing better than the other four Democrats in Arizona. OK, none of the top five have been polled in Minnesota yet. (Only Klobuchar has been.) So they are all still on one line. 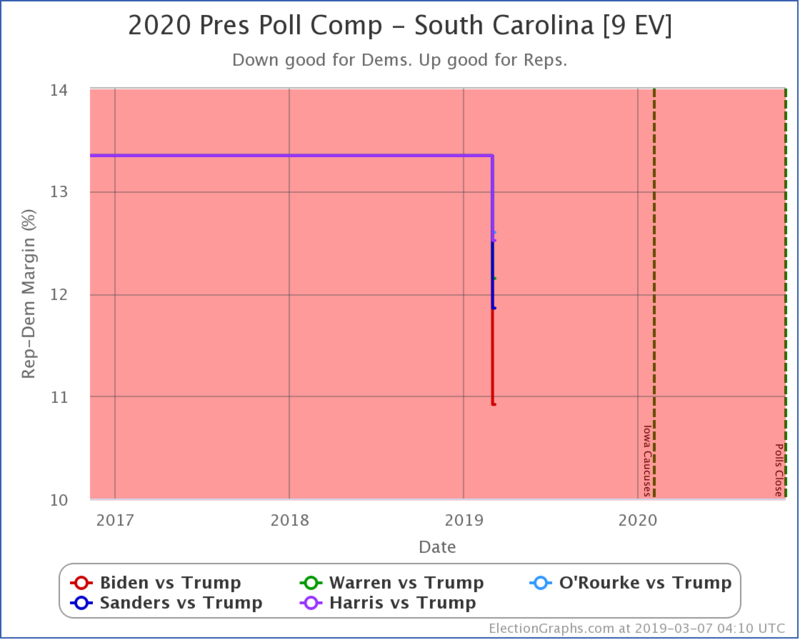 Biden doing better than the other four Democrats in South Carolina. 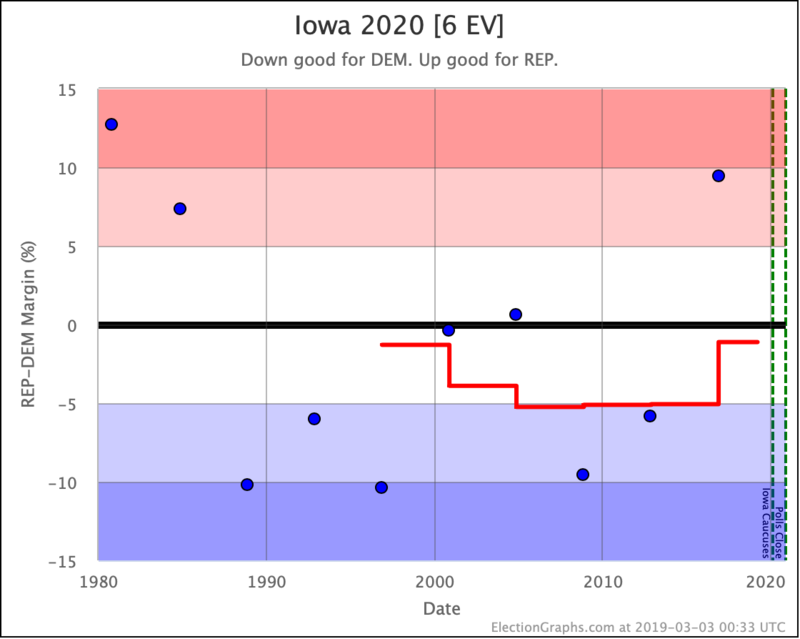 Biden doing better than the other four Democrats in Iowa. 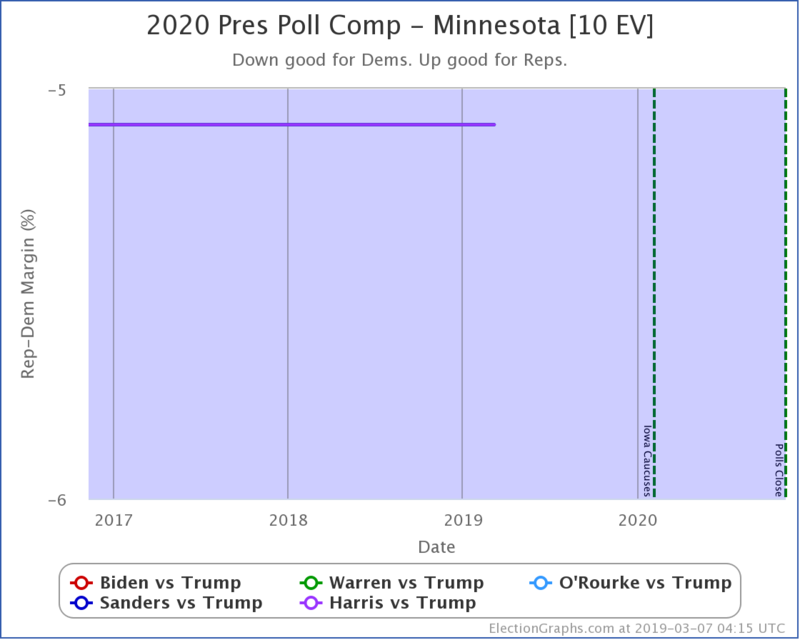 OK, we finally have a state where Biden has been polled and he isn't doing better than the other Democrats. 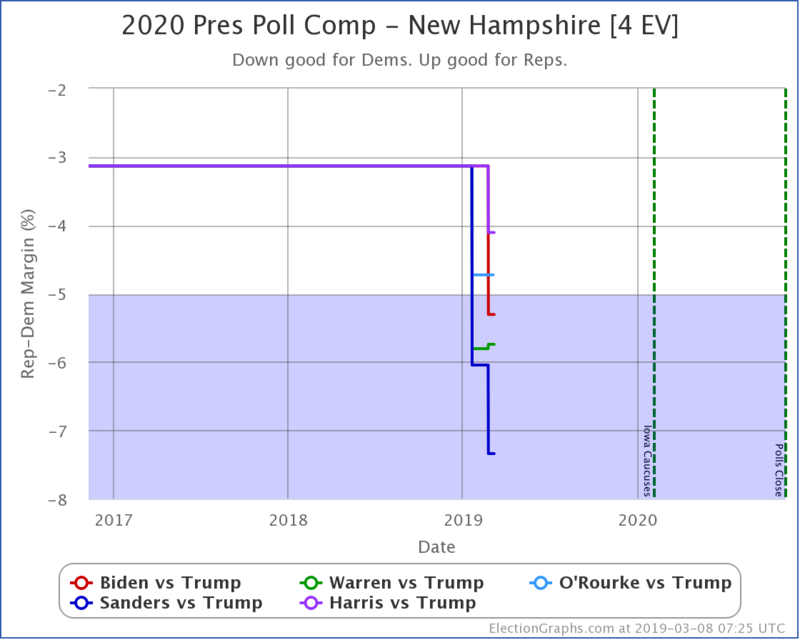 In New Hampshire, both Sanders and Warren do better against Trump than Biden does. But that is it. 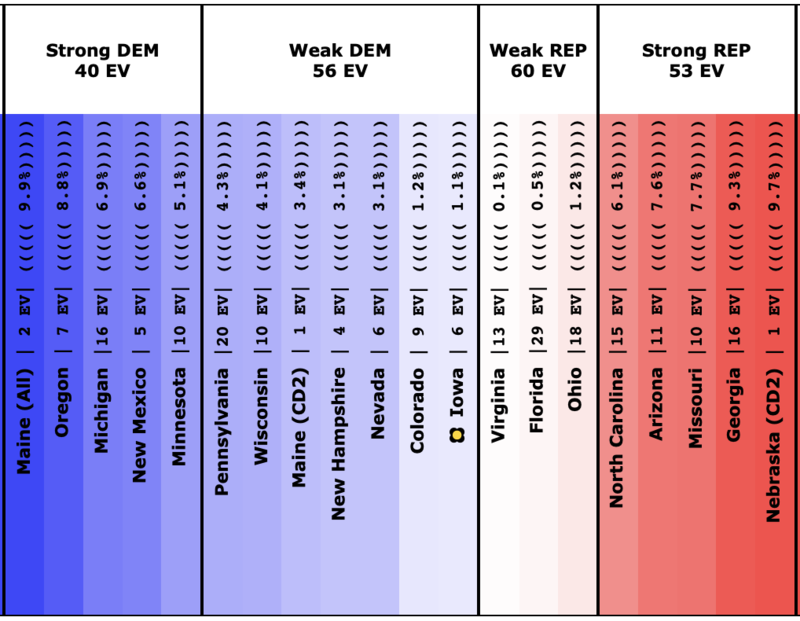 Out of 10 states where we have state polls so far, Biden does better than the other four Democrats in 7. 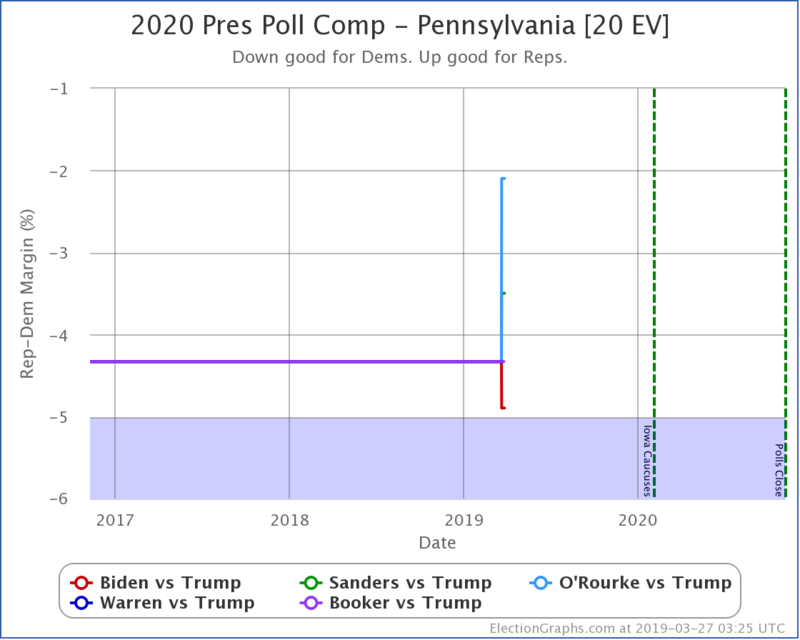 In 2 Biden hasn't been polled yet. Only in 1 does another Democrat do better against Trump. Now, to be clear, at this stage in a Presidential race, this may be due entirely to name recognition. Most people may still not have much of an idea who Warren, O'Rourke, and Harris even are. But surely they would know who Sanders is, right? His name recognition must be comparable to Biden's. Right? 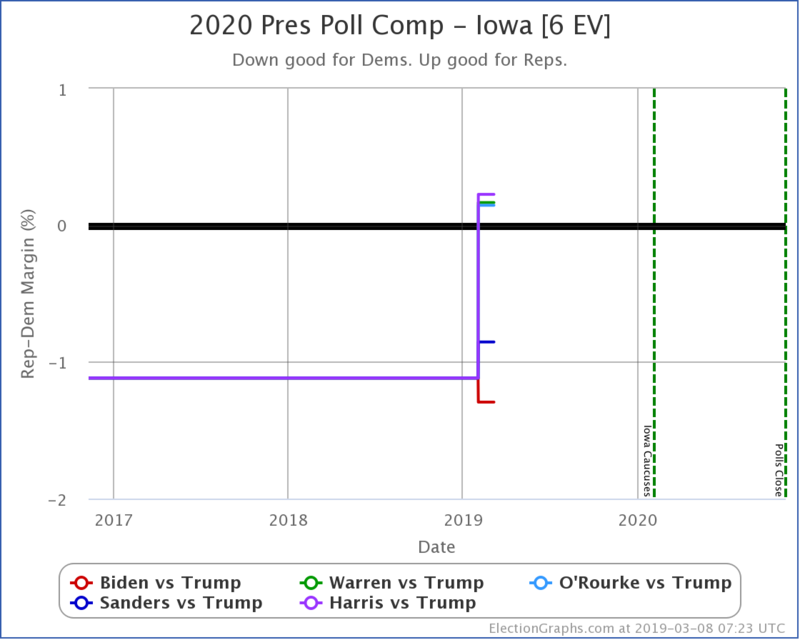 In any case, the way Biden consistently is outperforming other Democrats against Trump in the polls so far is striking. And he hasn't even officially said he is running yet. 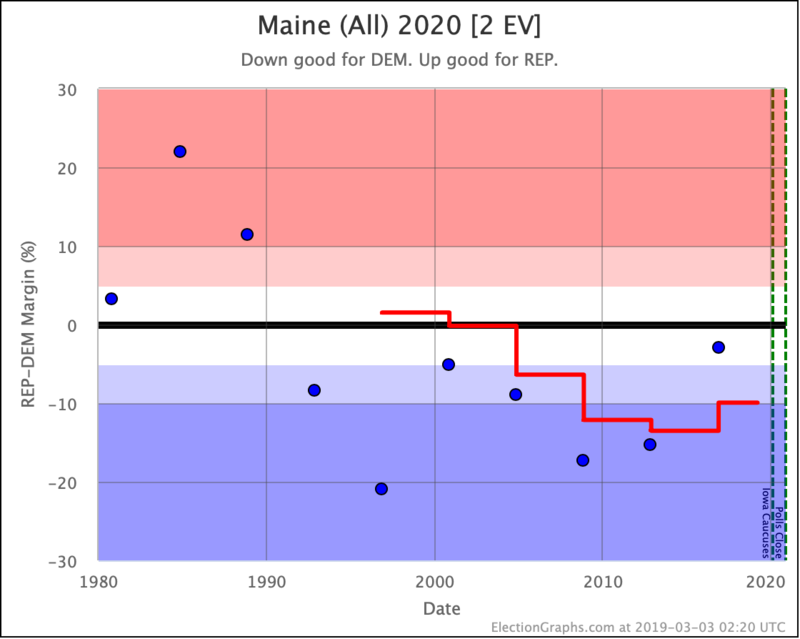 It will be interesting to see if this pattern continues as the field starts to gel, and the other candidates get better known. 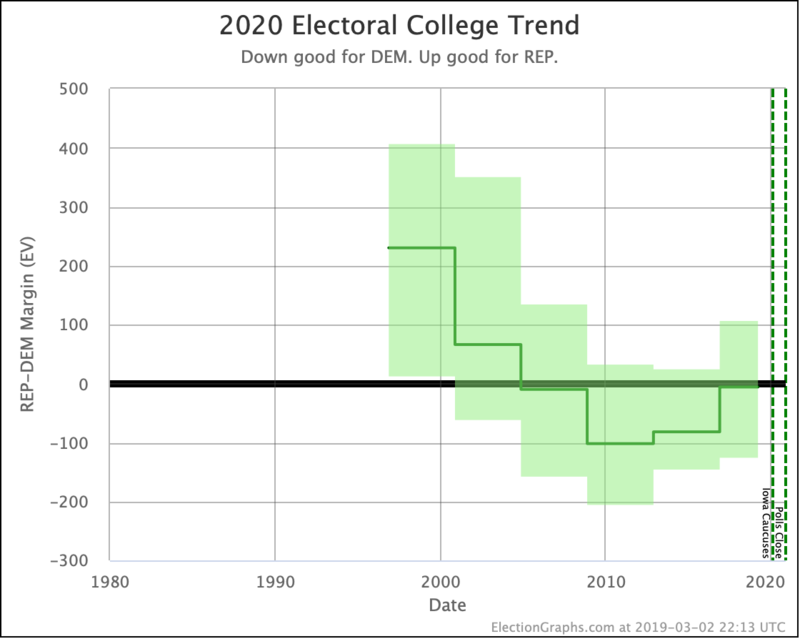 This post is an update based on the data on the Election Graphs Electoral College 2020 page. Election Graphs tracks a poll-based estimate of the Electoral College. The charts, graphs, and maps in the post above are all as of the time of this post. Click through on any image to go to a page with the current interactive versions of that chart, along with additional details. 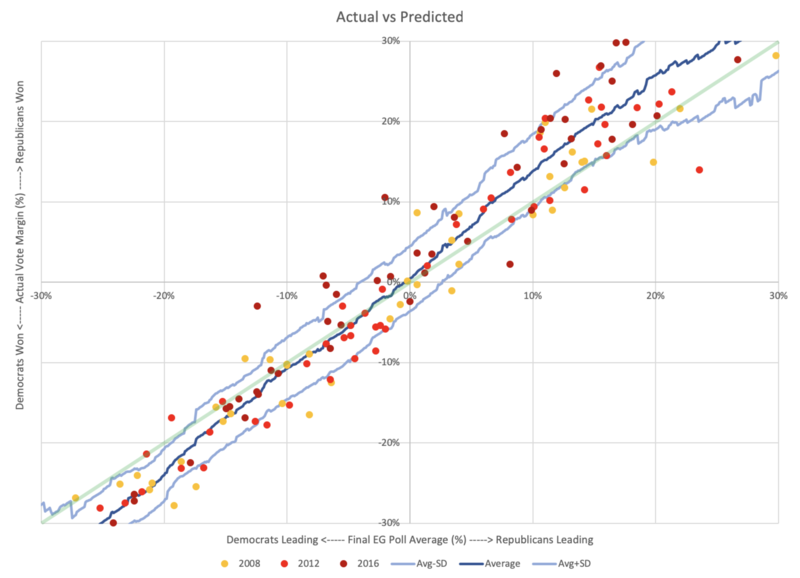 Follow @ElectionGraphs on Twitter or Election Graphs on Facebook to see announcements of updates. For those interested in individual poll updates, follow @ElecCollPolls on Twitter for all the polls as they are added. If you find the information in these posts interesting or useful, please consider visiting the donation page. Well, here we are. 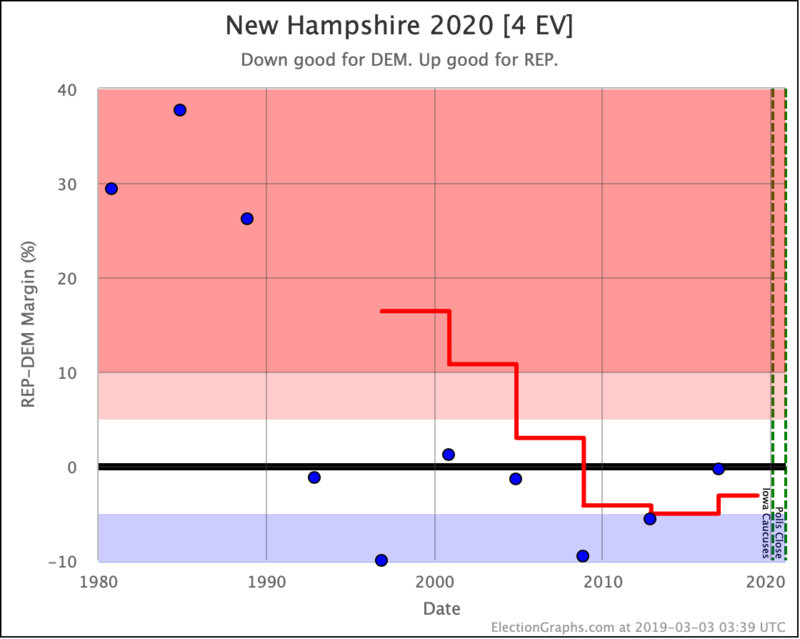 A few months later than I intended, but it is finally time to launch the Election Graphs coverage of Election 2020. 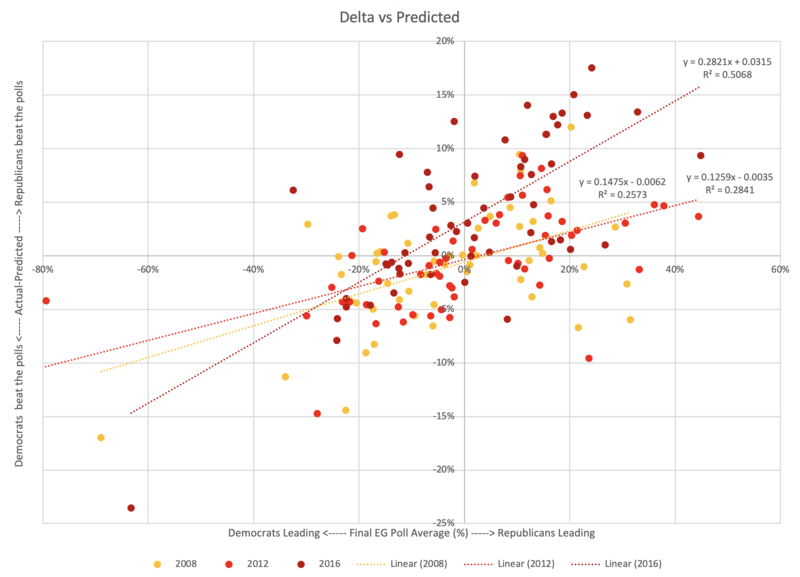 Before I start rolling in the state polls that have already come out, let's look at a more general Democratic vs Republican view based on the last few elections, just as I did four years ago. 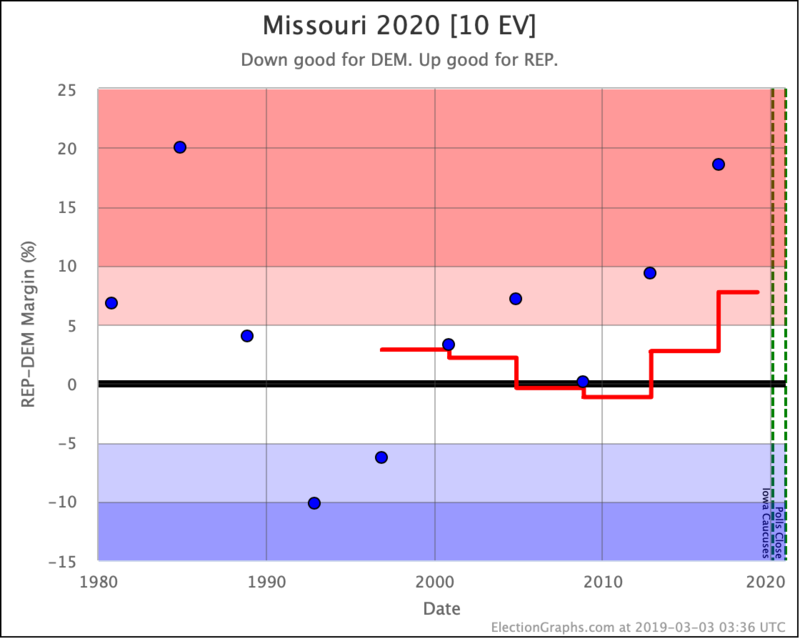 Election Graphs uses a five poll average generally (with certain exceptions I won't get into here). 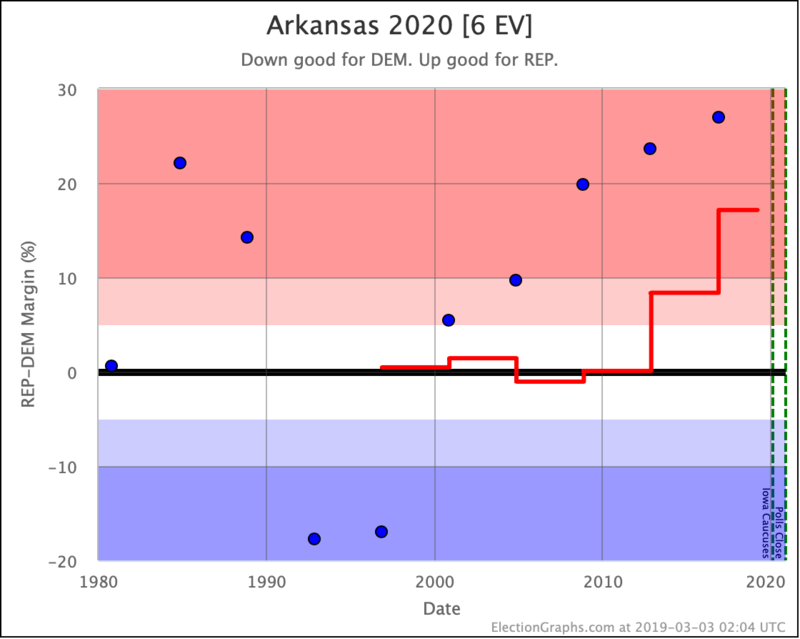 When there have not yet been five polls, we use previous election results to "jump start" the poll averages. 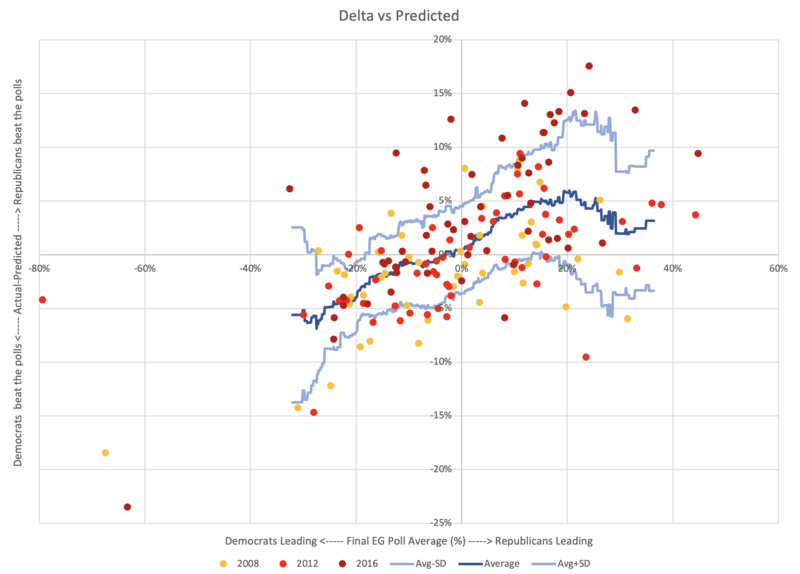 The map above represents the average percentage margins (Republican-Democrat) over the last five election cycles. That would be 2000, 2004, 2008, 2012, and 2016. This is a very long time period. Things look different in 2019 than they did in 2000. 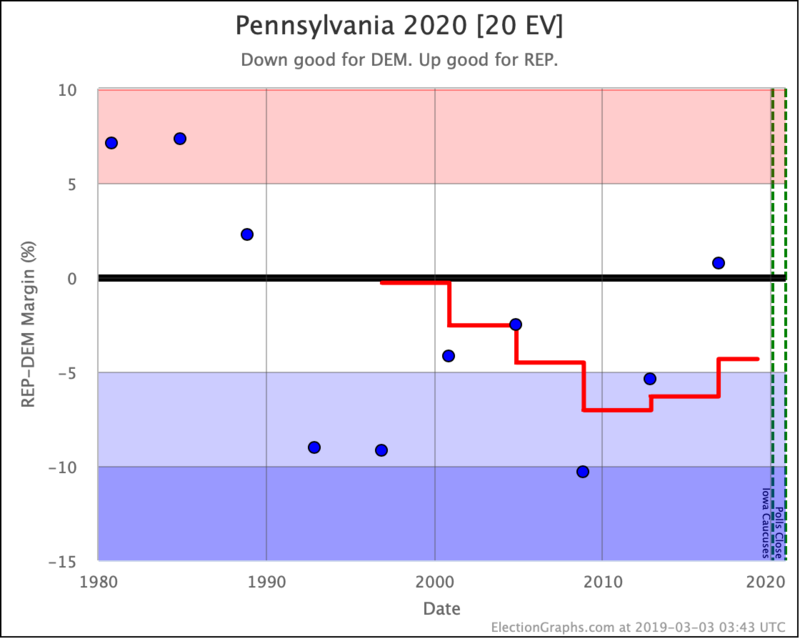 You could argue that just using the 2016 results would be a better starting point, but averaging over a long time period like this to some degree gives us an impression of where states stand independent of the specifics of any one specific election. 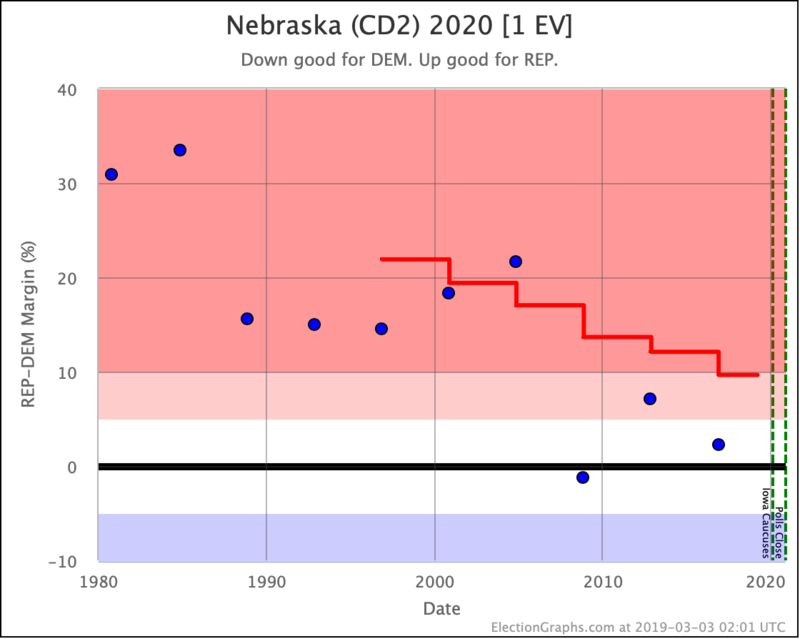 These are the states (and Maine and Nebraska congressional districts) that look like they are in play based on the historical results from 2000 to 2016. Once we get close to the election, "Strong" states mostly will slip out of reach. (Although Wisconsin was a "Strong Clinton" state and Trump still managed to win it, so it CAN happen, it is just exceedingly rare.) This far out though, just under 612 days until the first election night polls close, this whole zone is potentially up for grabs. If the right set of events happens, even some states outside of this group may end up becoming competitive. Major changes do happen during presidential campaigns. But here at the beginning, it seems unlikely that any of the states (or CD's) outside of those above will be in play. 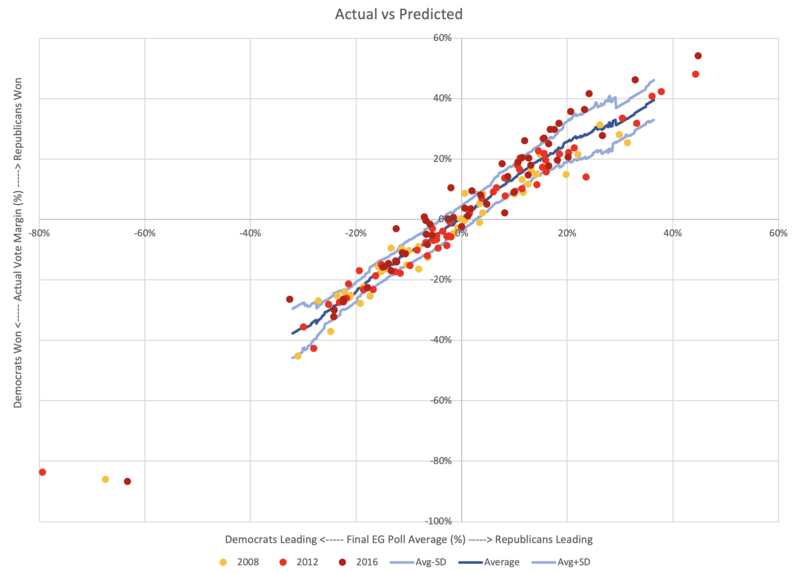 Things will move quickly as new polls putting actual candidates against each other get added. But this is the starting line. Where does this put us in terms of who might be ahead or behind? 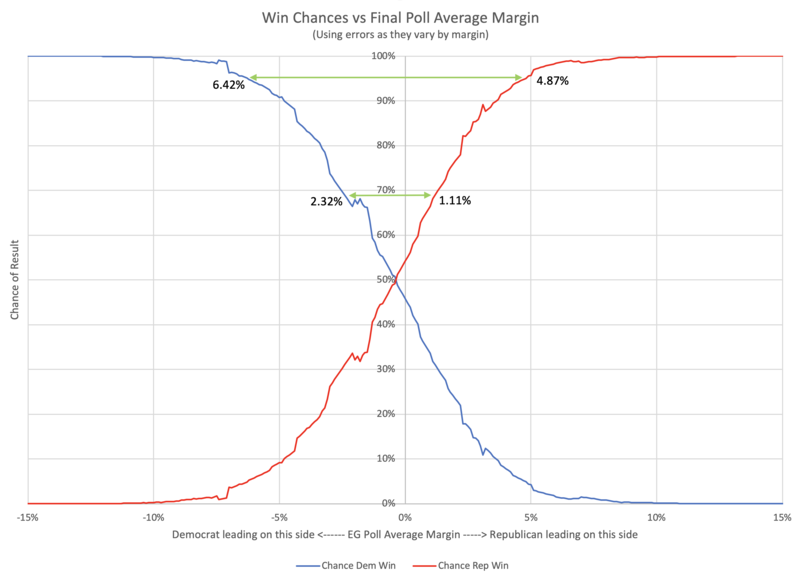 Election Graphs traditionally not only shows an electoral college breakdown based on who is ahead in every state but also where things would end up if you let all of the "Weak" states swing to one or the other candidate to generate "Best Case" scenarios for each candidate. 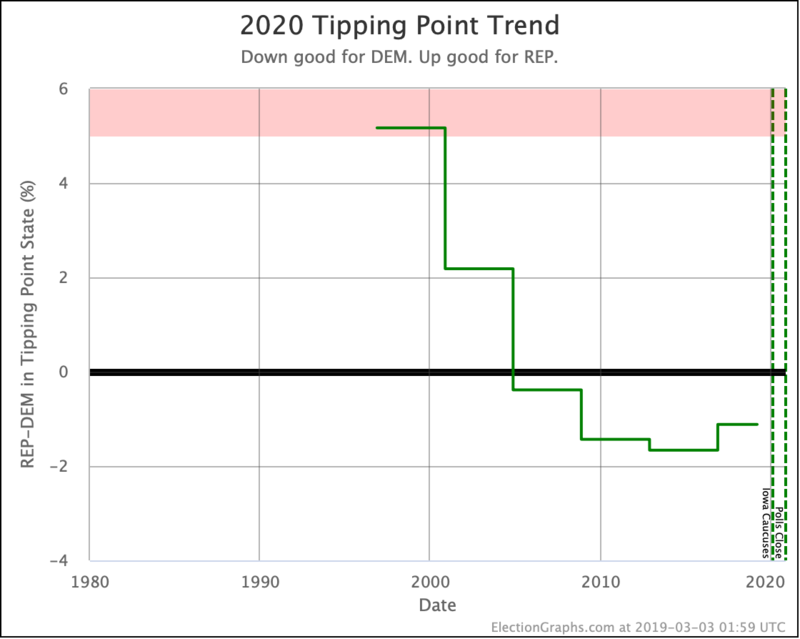 The tipping point state is Iowa where DEM is ahead by 1.1%. So… we start at essentially a dead heat. The average of the last five elections (three where Republicans won, and two where Democrats won), is a Democratic squeaker. When you throw the "Weak" states from side to side, you get a fairly large range as well. That's as good a place to start a presidential race as any. Dead even. 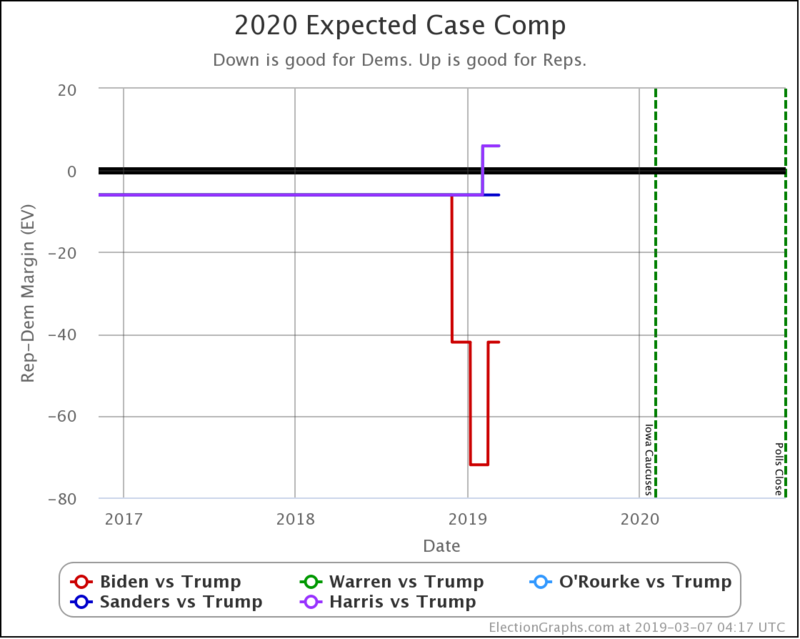 Now the specific candidates for 2020 will start differentiating themselves with their campaigns, and they will move this to one side or another… or of course, we can arrive at the election itself with things still too close to call… which is always fun. 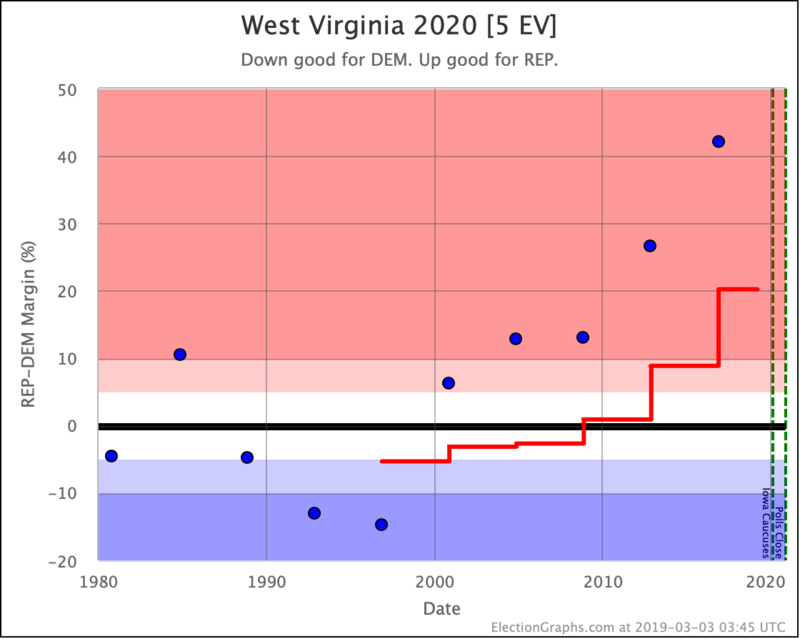 Before I close out this post and start adding in actual 2020 polls though, it is worth also looking at how this "five election average" has shifted over the years. 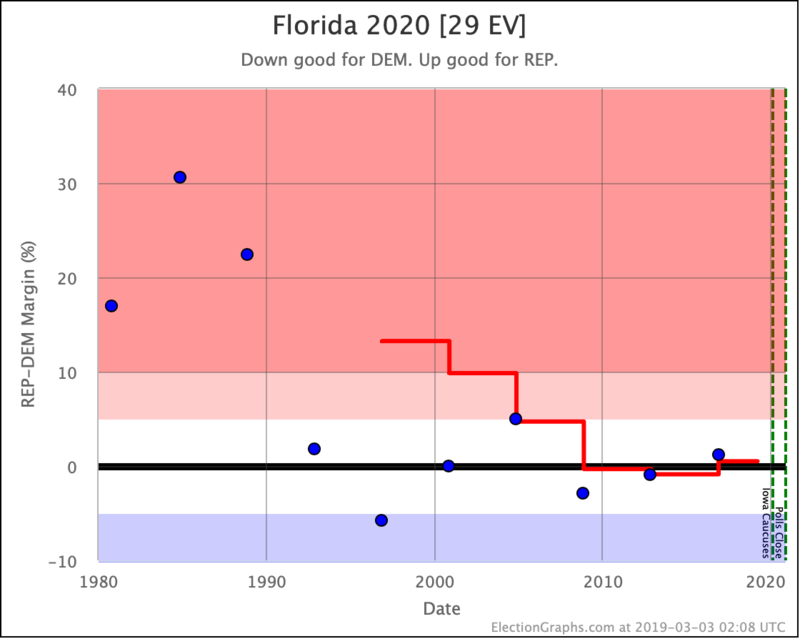 I currently have elections back to 1980 entered into the data Election Graphs pulls from, so we can look at these averages back through 1996. 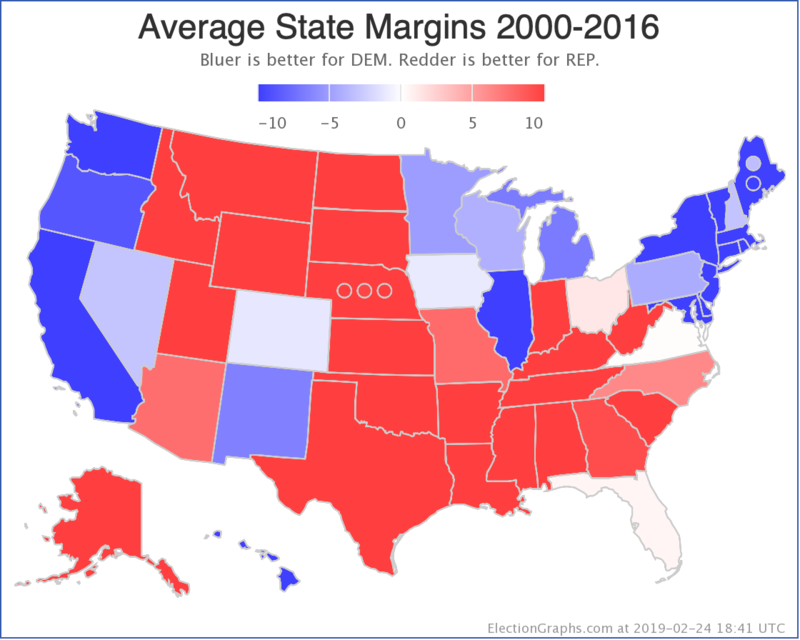 From 1996 through 2008, each election moved the electoral college results based on these averages toward the Democrats… even when the Republicans won… because they won by less than the Republicans from the earlier elections that dropped out of the average. That stopped in 2012. Obama won in 2012, but not as strongly as Clinton won in 1992, which dropped off the five election average that year. Then Trump won in 2016, which was obviously a more Republican result than Clinton winning in 1996. 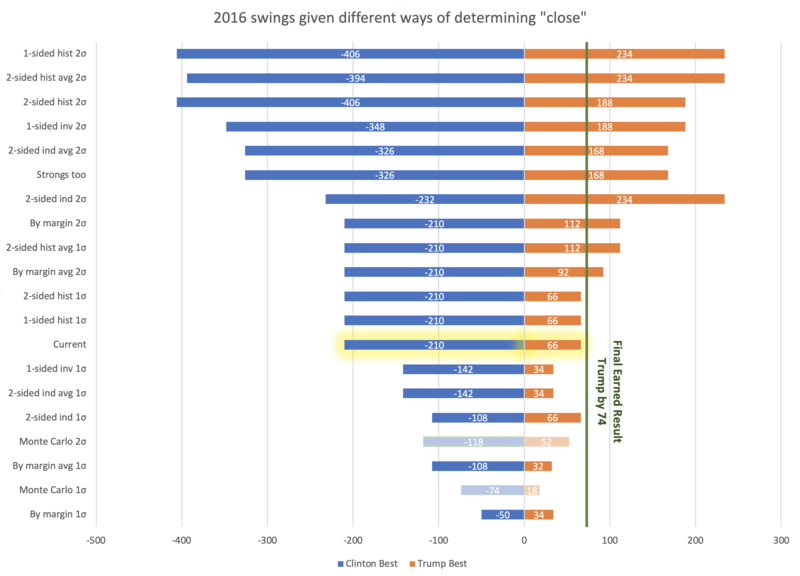 2016 also reversed another trend, which was that the electoral college totals of the states that were closer than 5% had been going down with each election. In other words, there were fewer close states each time. But dropping 1996 and adding 2016 expanded the range between "best case" scenarios a bit. We have a wider playing field going into 2020 than we did going into 2016. This basically shows the same pattern, so I won't spend time digging deeper there. But there is one more place to spend a little time. Time to look at how each state moved from the 1996-2012 average to the 2000-2016 average. 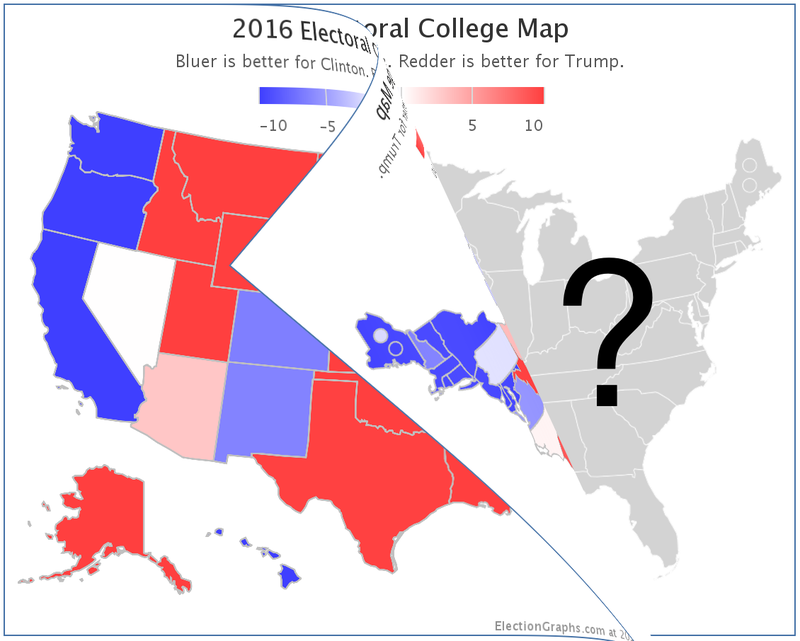 As expected, since we are replacing Clinton's 1996 win with Trump's 2016 win, the overall map becomes redder and blue retreats. Now let's look at individual states that moved to different Election Graphs categories ("Solid", "Strong", "Weak" for either party) in this change. All of the states moved of course. The ones highlighted here are just the ones that shifted between my categories. And of course, many of those were not decisive. But the shift toward the Republicans is clear. 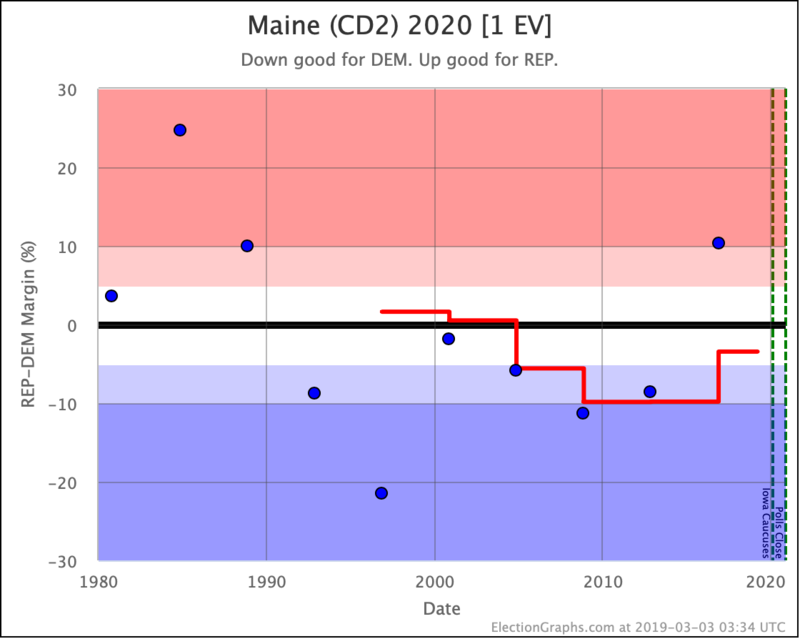 Next up, very soon, I'll start folding in the polls on specific candidate matchups that have already been released on the state level, and we'll see how things look once we are looking at real data on the 2020 race rather than just long term generic averages. The race is on, and Election Graphs will be tracking it for you.